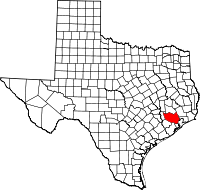 ^ "Harris County". Texas Almanac. Texas State Historical Association. 2015-05-22. Retrieved June 20, 2015. ^ "Republican judges swept out by voters in Harris County election". Houston Chronicle. 2018-11-08. Retrieved 2018-11-14. ^ "Kinder Houston Area Survey: 2018 Results". Kinder Institute. 2018-04-23. Retrieved 2019-03-18. ^ a b Land, David (2018-09-06). "Report: Harris County Should Consolidate Law Enforcement Duties". Houston Public Media. Retrieved 2018-09-11. ^ Bonnin, Richard. "Carnegie Foundation Gives University of Houston its Highest Classification for Research Success, Elevating UH to Tier One Status". University of Houston. Retrieved 2011-02-08. ^ "UH achieves Tier One status in research". Houston Business Journal. January 21, 2011. Retrieved 2011-07-06. ^ "UH takes big step up to Tier One status". Houston Chronicle. 2011-01-18. Retrieved 2011-07-06.